SQL Delta compares the database structure of two Microsoft SQL Server databases and highlights differences between tables, views, stored procedures and other elements within each database. The user can then choose to script and update the databases to synchronize the structures. 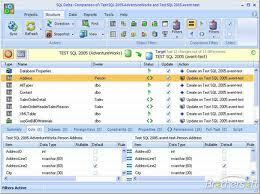 SQL Delta also allows you to compare data differences between two databases and also synchronize data differences. You can report on the differences between databases as well as the structures of a database. The report details can be exported in a variety of formats including PDF and HTML.